Adjaye said: “Making Memory is set up as a provocation or question to the public I am not scared of a narrative that unfolds and splinters. I find that more representative of the collective consciousness that we all live in today”. The exhibition examines the idea of the monument on how architecture and form are used as storytelling devices. Monuments are a record of who we are and are deeply embedded in our psyche as a way of memorising triumphs and failures. Each of the seven projects are embedded in deep symbolism, like the unbuilt Coretta Scott and Martin Luther King Jr. Memorial in Boston and the National Cathedral of Ghana. 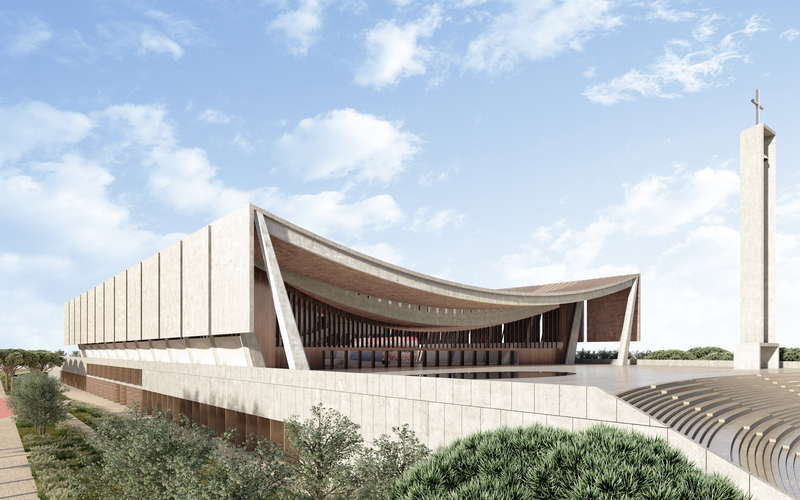 Adjaye gave us an insight into commission of The Cathedral by the President of Ghana, which is a four year build currently going through the city planning process and planned for Accra in 2024. Adjaye said: “Ghanaian culture it’s very spiritually based, a celebration of sort of life and death all those sort of things. And there isn’t a national space for it, there are 300 religious spaces all over the country, there isn’t a national space, so this President felt that you know it was poignant, you know Kofi Annan’s funeral which was done in a sort of a concert and a sort of commercial Hall. How deficit kind of situation is that, that the country didn’t have a place to dignify such a person. So, you know the Cathedral is going to be that space of national coming together to celebrate mourning. The main chamber is for five thousand people. But I’ve sort of devised it in such a way of separating the podium where you can get another five on each side. So, it has a double podium which can then be just temporary. Temporary seating can be erected but the whole thing is designed as a gathering space. When we got the site, you know it was just a small site and we made the case for making a national park because we said that many people coming into this space that would kind of allow them to now have this focal sort of landscape with this focal space”. Gwangju River Reading Room “The River Reading Room”, situated on the banks of the Gwangju River was completed in 2014. Adjaye explains his view on what he sees important going into the future when it comes to the design of memorials and how it might change. “I think it’s you know the first thing that’s happened is that it’s become very spatially, spatially meaning that we,… there’s now a great emphasis on the ritual of the monuments that in a way I think that the monument before had a kind of ritual quality to do with formal remembrance you know, on the fourth of so-and-so you do this. But I think that there’s a kind of new quality in the ritual of the objects in everyday life where people just go when they want to go to engage with it, to remember the experience of it, not to kind of wait for somebody to set a tone on top of it and to then use that to make their own reflection so there’s that. But I think on top of that spatial narrative is also I think a kind of content narrative that’s also kind of appearing in that it’s a way in which you know different voices might start to be dissolved into the experience of the space and sometimes even conflicting narratives that are conflicting to the formal nature of what the thing might be and what actually is a societal aspiration might be it can be coded in. So that there’s a way in which you know, I always think that an architect has this kind of very crazy job of looking down two bottles with two eyes. In the sense what I mean by that is that he is at once serving a client and dealing with the brief but he’s also responsible to society and to the history of architecture as a built form that is much much further than the client relationship. So, there’s a duality that there’s always I think really important to remember as an architect because it’s what keeps you in check that you’re not just serving the client but you’re also serving a bigger idea”. “These monuments some are in very prime prominent places like the National Museum of African-American History Culture, The Holocaust Memorial and the Cathedral are three of the three epicentre type sort of projects, but the others are also about monuments that you may encounter in your everyday they could just appear. you know the Gwangju Pavilion is really the location, it’s just a neighbourhood in the city and that was important that it felt like it wasn’t marking the spot where the students fell it’s marking a space that citizens live in and then bringing that. So it’s dissolving the monument from a kind of structural centre to a decentred idea of what a monument could be and it then uses the idea of engagement with literature as an act almost like an activist act that actually when you pick up a book you may think you’re just reading but yet you’re engaging in this idea of knowledge sharing and that is a very powerful social act beyond just educating yourself as is demonstrated when you lose that right by those students who lost their lives. And that’s why the monument is like there it’s a monument”. Adjaye is the lead designer of the National Museum of African American History and Culture, located on the National Mall in Washington, DC. He was born in Tanzania, the son of a Ghanaian diplomat and he moved to the UK age nine.